It seems that the Chevy Volt will soon have competition from within its own ranks. 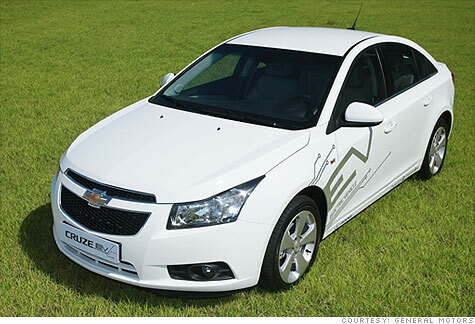 General Motors is said to begin fleet testing a rather potent Cruze EV next month in South Korea. US availability is still up in the air apparently, but if all goes well, chances are GM will be the latest automaker to offer a pure EV vehicle like the Nissan Leaf and Mitsubishi i-MiEV. LeftLane reports that the EV Cruze will use a 31-kWh battery pack — a good amount larger than the Leaf’s 24kWh pack — along with a 200 HP electric motor, which is said to propel the car forward to 60 mph in a quick 8.2 seconds. A fully-charged battery pack should power the car for 100 miles with recharging from a 220-volt outlet clocking in between 8 and 10 hours. No doubt the Chevy Cruze EV’s price will ring in lower than the Volt’s $41k MSRP. While the vehicle will likely steal some sales away from the Volt, the two vehicles are simply different beasts and should appeal to a different demographic. The closest competitor to the Cruze EV is the $32k Leaf. Most auto pundits already enjoy the Cruze’s confident interior and ride, so GM might have a winner if the electric powertrain doesn’t muck things up.